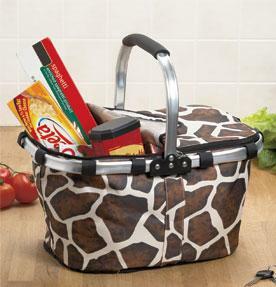 This handy Giraffe Folding Shopping Basket is the same size as plastic grocery basket when open and collapse down for easy storage. * Fashionable animal print basket is ideal for carrying groceries from the store or farmer’s market, toting gardening supplies, or taking along on a picnic. * Each basket has a zip top, an aluminum handle and foam padding for a soft grip. * The bottom features protective plastic feet to reinforce the base and help reduce wear and tear. * Comes with 4 plastic slides (8″ x 1″) that slip into the designated pockets for stability. * Measures 17″ x 11″ x 9-1/2″ with a 21″ arch-shaped handle. * Select from Giraffe, Zebra and Leopard. * Wipe-clean polyester fabric on an aluminum frame.